If Zelda making its first appearance in Mario Kart wasn't exciting enough, Nintendo sweetened the deal today. 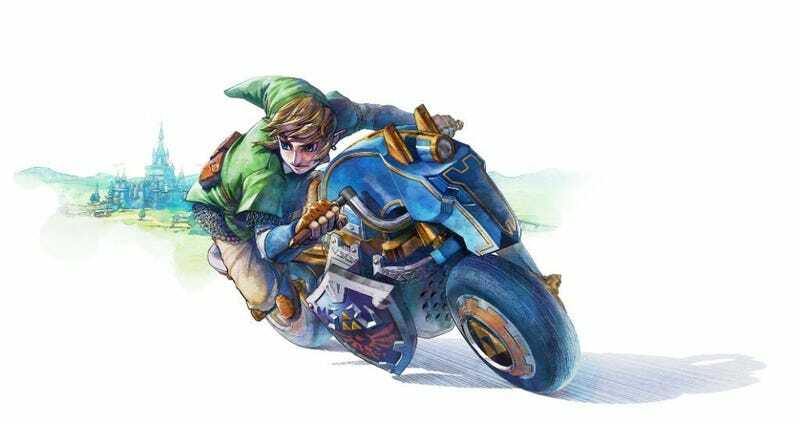 When Link (if that is his real name) arrives in Mario Kart 8 next month, the company said he'll be bringing a new kart-friendly version of his trusty steed with him. Nintendo (sort of) revealed the Zelda-themed ride today in a message from the Nintendo of America Twitter account. It's called the "Master Cycle," and while NOA only provided fans with a sketch, they promised it'll have "plenty of horse power." Har har har. Now if they'd just add the buddy system from Double Dash into Mario Kart 8 like they hinted they might, we'd have a regular horse-and-buggy! Ok, I'll stop now I promise. Each Add On Content pack will contain two new cups, each with four courses, which, in total, increases the number of available courses by 50 percent. The Add On Content packs include classics like Wario's Gold Mine from Mario Kart Wii, as well as new courses, some taking place in the worlds of The Legend of Zelda and Animal Crossing. New vehicles will also arrive with each pack, including the Blue Falcon kart representing the F-Zero franchise in the first AOC pack. Players who pre-ordered the new DLC, meanwhile, see a Triforce icon every time they hop over to Mario Kart 8's Grand Prix menu. I'm guessing some people will take that as a sign that there's a Hyrulian cup incoming...meaning that Zelda fans might finally get a chance to revel in Nintendo's self-referential glory the same way Yoshi believers have been able to for a while now by racing with Yoshi, on a Yoshi Bike, through Yoshi's Valley.